Harry Carpenter Wommatakimmi was a well known and prolific Tiwi Sculpture artist. 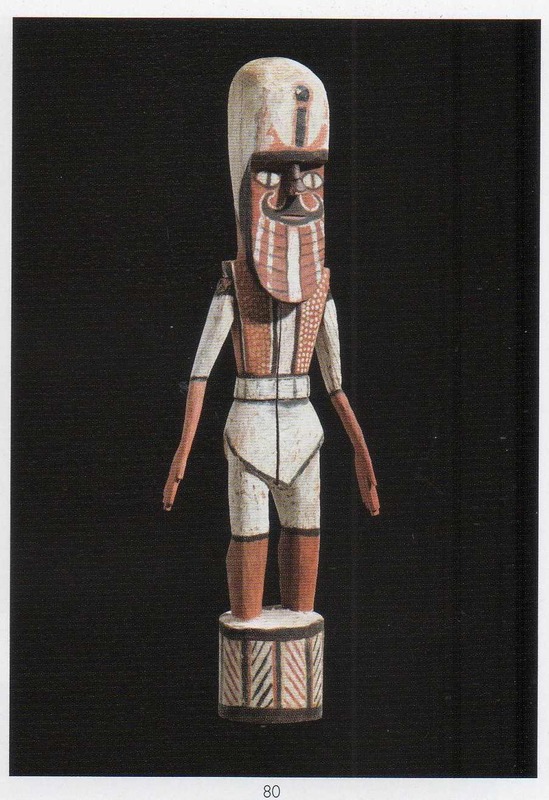 He worked in Paru on Melville Island in the 1970’s and produced many great painted sculptures. The aim of this article is to assist readers in identifying if a Tiwi sculpture is by Harry Carpenter by comparing examples of his work. If you have a Harry Carpenter Wommatakimmi sculpture to sell please contact me. If you want to know what your Harry Carpenter sculpture is worth to me please feel free to send me a Jpeg. I would love to see it. Harry Carpenter has done at least one carving of a seabird perched on the spirit figures head. His sculptures depict a Tiwi Dreamtime story about Purukupali and Bima. Purukupali was the first man on earth. While he was away hunting his wife Bima had an affair with Purukapali’s younger brother Tapara. While making love to his brother she left her baby Jinani under a tree. The baby died when the hot sun shifted and the baby was no longer in the shade. When he returned Purukupali in his grief walked into the sea with his dead son and disappeared forever. Tapara, with his face slashed by a stick, became the moon. Bima became a curlew (bird). To the Tiwi people, Purukupali was the first death, This first death leads to the first Pukumani (burial) ceremony. Harry Carpenter Wommatakimmi was born around 1920 and died in 1980. Unfortunately along with many other early Aboriginal Artists not a lot of information is available about Harry Carpenter. He had a brother who also carved called Aurangnamirri. 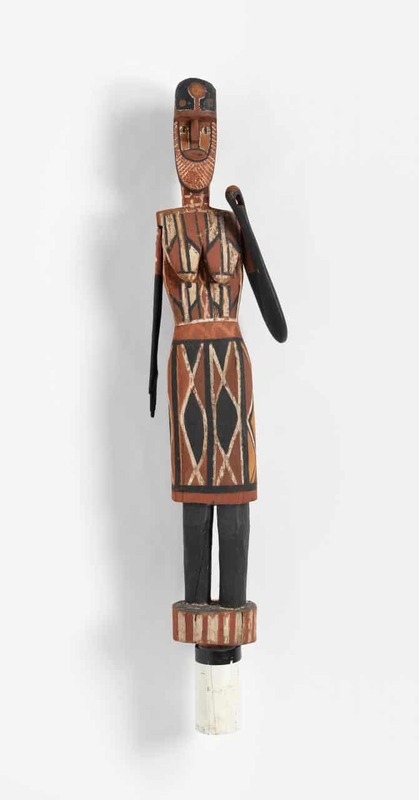 He was probably the son or of another lesser known pioneering artist Black Joe Wommatakimmi. Wommatakimmi was such a prolific and skilled carver it earned him the nickname Harry Carpenter. If anyone knows more information about the biography of Harry Carpenter, please contact me as I would like to add it to this article.